The #NOTlistening Podcast is BACK!......Kind of! After several months away, and still taking a break until the new year, we decided to finally release some #NOTsensical style episodes and begin the intergration of all things....well #NOTsensical. In this episode Adam, Will and Ash present some hilarious segments from the spin off show #NOTsensical! a LIVE radio show from CCR 104.4FM. 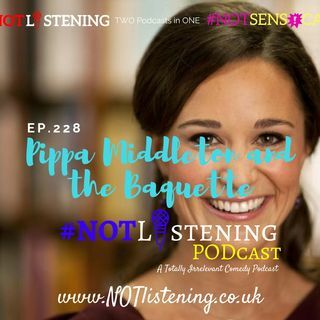 In this episode you can hear how two posh idiots from Midriff got ... Maggiori informazioni invited to Pippa Middletons wedding back in the Summer. As of 2018 ALL #NOTsensical Podcast Episodes will be available for download ONLY on The #NOTlistening Podcast Feed. #NOTsensical is aired LIVE (almost) every Thursday Evening 7pm UK TIME on Chelmsford Community Radio 104.4FM and online and TuneIn App.